When I checked the module, I couldn't believe the extent of the damage. Almost everything is gone. All power transistors, drivers, pre-drivers and opamps. Even the 5W 0.22 ohm emitter resistors are opened. For the record, I've marked all components that are blown. Let's take a closer look at what happened. The most obvious clue is the 100 ohm resistor at the output of the front end 4560 opamp. It's burnt crisp. This can only come about when the amp is driven beyond it's limits. It probably caused the pre-drivers to fail, thus triggering a chain reaction. Driver's bases are pulled high, causing them to blow. This in turn caused the bases of the power transistors to go high, with catastrophic result on the power transistors. It's so bad that even the DDT circuit is damaged. 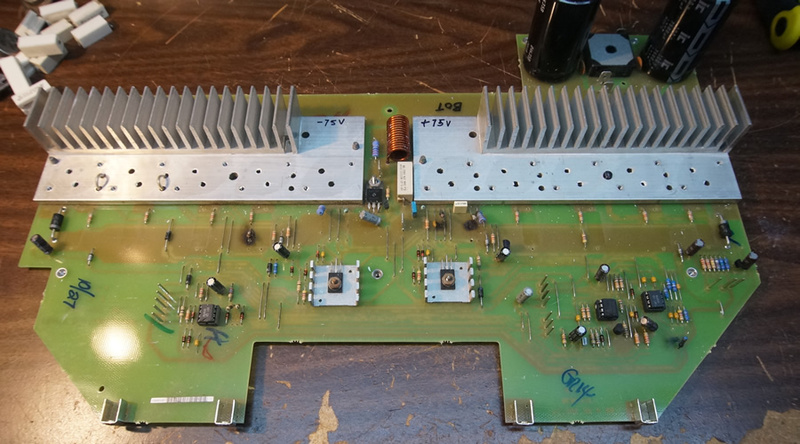 Note the two burnt 1K ohm resistors at the DDT input. Since they are burnt, we can infer that the associated opamp is gone as well. Yes, but is it worth it. A lot of man hours need to be expended, meaning it's going to be expensive. The underlying cause of this amp failure is not bad design or manufacturing. Most likely, it's due to abuse or ignorance of the user. What disappoints me though, is the way this amp fails. When it does, it's total. Not good.